The BMW 7 Series is car you get when you want the biggest BMW you can buy. What do you need to know before you buy a BMW 7 Series? Don’t worry, we’ll tell you everything right here in the our Buyer’s Guide. BMW makes sports sedans. That’s their bread and butter. They are the “Ultimate Driving Machines” not the ultimate “Riding In The Back Seat” machines. And it’s for this reason that the 7 Series doesn’t quite sell as much as Mercedes’s big luxury car. People buying these ridiculously high-end cars want a car known for its luxury, not necessarily for its sporting credentials. But BMW owners see the 7 Series as the next step from their 5 Series. It’s the car that, once they’ve “made it,” they drive around in comfort and reminisce about the old days driving their first car: that old hand-me-down E30. 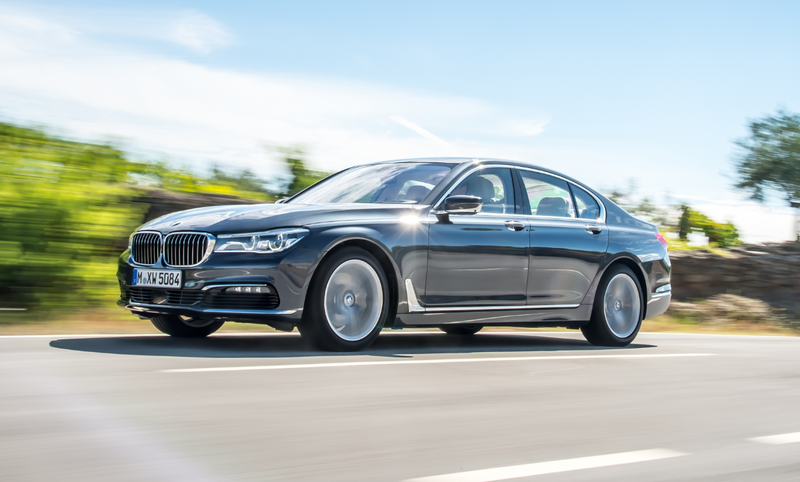 The BMW 7 Series is all-new for 2016, offering flagship levels of luxury and tech. It sits on a brand new carbon fiber-intense modular “35up” platform, gets new interior and exterior styling, updated infotainment and safety systems, tons of new cool gadgetry and even a new plug-in hybrid version called the 740e later this year. BMW’s 7 Series comes only in long-wheelbase form, sitting at a whopping 207 inches in length. It’s big. Right now, there are only two 7 Series trims available. A twin-turbo 3.0-liter Inline-six-powered 740i and a twin-turbo 4.4-liter V8-powered 750i xDrive sedan. All 7 Series trims get cool features like active grille shutters, automatic 4-zone climate control, limited slip differential, active air suspension, 16-speaker Harman Kardon audio system, Gesture Control, wireless charging, WiFi, a huge head-up display and lots more. There’s tons of cool gadgetry in this big Bavarian sedan. The I6 is no slouch. With its 320 horses, it can get the big beast to 60 in 5.4 seconds. But if it’s up to us to buy a 7 Series, we’d go for the all-wheel drive V8 750i xDrive. It’s quick, hitting 60 in 4.3 seconds. And for a car that quick to come with tons of luxury and gadgetry is a thing of beauty. We’d tack on the $4,100 Autobahn package, which includes active four-wheel steering, which adjusts power-assist based on vehicle speed, and Active Comfort Drive, which uses a camera to preview the road ahead and adjust damper settings accordingly. We’d also opt for the Rear Executive Lounge Seating Package, for those days when we just want to chill in the back seats. That package adds electric reclining seats and footrests, massaging ventilated rear seats and a 7-inch tablet that can adjust seats, lighting, climate control, infotainment. That $5,750 option requires the addition of a $2,700 Executive Package and a $3,900 Luxury Seating Package, bringing the total to $114,845. That’s a big number, but that’s the price to pay for sheer opulence.